The terrible duty her Captain had to carry out. “Suddenly the entire ship is roughly shaken. The colossus heaves far over, and everything that is not fixed is upset. The first direct hit! The torpedo pierces the fore part of the ship. Its effects are terrible. Iron, wood, metal, parts of bodies, and smashed ships’ implements are all intermixed, and the electric light, by chance spared, continues to shine upon this sight. Two decks lower, in the diesel dynamo room, there is still life. That compartment has not been hit, and twenty-seven men, in the prime of life, have been spared, but the chamber is shut off from all others, for the water is rushing into all sections. They are doomed to death. Several 38-centimetre shells squarely hit their mark, working terrible havoc. The first hit the wireless department. Of the twelve living men who a moment ago were seated before the apparatus, there is nothing more to be seen. Nothing is left but a smoking heap of ruins. The second shot again pierced the fore part of the ship. The entire forepart of the vessel, as far as the diesel motor room, was past saving. Another broadside meant for the Lützow fell short, but a torpedo boat close by disappeared, leaving only a few odd pieces of wood and a smashed lifeboat drifting around. It is now half-past 7, and the hostile circle grows ever smaller. The Lützow and the Seydlitz lie with their bows deep in the water; both are badly mauled. The forepart of the Lützow was in flames. Shells burst against the ship’s side in rapid succession. A terrible sight is presented on board the Lützow, and it needs iron nerves to look upon it coolly. Hundreds have lost their lives, while many have lain for hours in torture, and the fight is not yet over. The bow is now crushed in and is entirely submerged. The four screws are already sticking half out of the water, so that the Lutzow can only make eight to ten knots an hour, as against the normal thirty-two. The Admiral decides to transfer to the Moltke. He gives orders to turn and get away from the scene of the fight, but the Lutzow has not gone a mile before she receives a broadside of 38-centimetre shells. The entire ship was filled with the poisonous fumes of the shells, and any one who failed to affix his gas mask was doomed to be suffocated. It was three-quarters of an hour before the lighting installation was restored. Then for the first time could the extent of the damage wrought by the salvo be seen. One of the shells had landed in the sick bay. Here there were only three doctors and fifteen attendants, besides 160 to 180 wounded. Of all those, only four remained alive. These four were hurled into the next compartment by the air pressure; there they lay unconscious. The Lützow was now a complete wreck. Corpses drifted past. From the bows up to the first 30-centimetere gun turret the ship lay submerged. The other gun turrets were completely disabled, with the guns sticking out in all directions. On deck lay the bodies of the sailors in their torn uniforms, in the midst of the empty shell cases. From the masts fluttered torn flags, twisted signal lines, and pieces of wire of the wireless installation. Had not the lookout man and the three officers on the commander’s bridge given signs of life, the Lutzow would have truly resembled a ship of the dead. Below, on the battery deck, there still lay innumerable wounded, but there was no longer a doctor to attend to them. Night came on and hope was entertained of getting away without a further encounter. But at 3 o’clock in the night news of the approach of two British cruisers and five destroyers was received and just at that critical time the fore and middle bulkheads gave way. Orders were given to carry the wounded to the stern. Then the order rings out: “All hands muster in division order abaft.” A tumult arises on the lower deck, for everybody is now bent on saving his life. It is impossible in that short space of time to bring up all the wounded, for they are scattered everywhere. Eighteen men had the good fortune to be carried up, but all the rest who could not walk or crawl had to be left behind. The twenty-seven men shut up in the diesel dynamo chamber had heard the order through the speaking tube, for many, mad with anguish, screamed through the tube for help, and it was learned that two of their number lay bound because they had become insane. Inspired by their sense of duty, these sealed-up men had continued to carry on their work in order to provide the ship with light. The last moments of SMS Lützow, by the French marine artist Albert Victor Eugenie Brenet (1903 – 2005). The torpedo boats, G. 38 and G.39, are standing by. The G.38 will fire four torpedoes to sink Hippper’s former flagship. Apparently a number of men had been so tired that they only woke up as the torpedoes exploded underneath them. They were seen running along her decks. The torpedo-boats now quickly took off the crew of the Lützow, and those left behind were doomed to death. It was resolved that no piece of the vessel should fall into the enemy’s hands. An order was given and a torpedo cleft the waters. Just then seven men were to be seen running like madmen round the rear deck. Over-fatigued as they were, they had apparently dropped off to sleep and only just awakened. In a very carefully tended war cemetary. As the torpedo exploded, the Lützow‘s bow quickly dipped, and the stern rose until she stood on end. Then she heeled over and sank, forming a great whirlpool that carried everything within it into the depths. 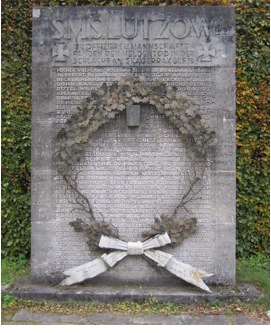 When the roll was called it appeared that there were 1,003 survivors of the Lützow; 597 men had perished in the battle.